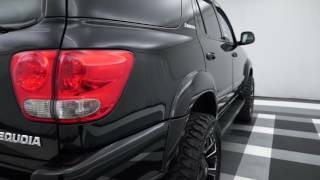 www.autobytel.com/toyota/sequoia/2012/?id=32972 The 2012 Toyota Sequoia is one of those vehicles that offers a ton of utilitarian value. 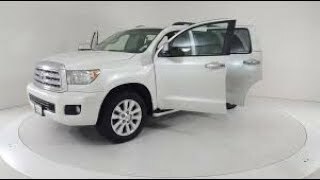 The Sequoia can seat up to 8 passengers, has tons of cargo room, and can tow 6900 lbs. There are 3 models of Sequoia for purchase: the base SR5 costs $40,930, the Limited costs $51,040, and the Platinum costs $58,580. 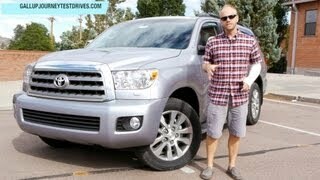 The 2012 Toyota Sequoia comes in either 2WD or 4WD. There are 2 different engines offered on the Sequoia for the 2012 model year. Them smaller engine can be found on the lower model SUVs. This 4.6 liter V-8 engine makes 310 horsepower and 327 lb-ft. of torque. The larger engine is a 5.7 liter V-8 motor that makes 381 horsepower and 401 lb-ft. of torque. Both engine comes with a 6-speed automatic transmission. Fuel economy is 14 MPG in the city and 20 MPG on the highway for the smaller 4.6 liter engine and 13 MPG in the city and 18 MPG on the highway for the larger 5.7 liter engine. On the outside there are a ton of standard features. The bumpers are color matched to the rest of the body. The Sequoia gets standard fog lamps and a chrome grille surround. The stock 18-inch alloy wheels look great but you can upgrade to a set of 20-inch alloy sport wheels which really stand out. The rear liftgate automatically opens and closes. Also the Sequoia comes standard with a roof rack, running boards, and mud guards. On the inside the Sequoia base model gets cloth seating but the Premium models get leather seats that are power adjustable. The standard radio comes with a CD player, Bluetooth, iPod connection, and Sirius XM Satellite Radio. You can upgrade to a great 12-speaker JBL Synthesis stereo system. There is also a touch-screen navigation unit as an option. 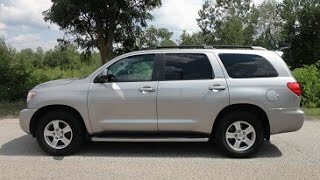 As stated earlier the 2012 Toyota Sequoia can seat up to 8 passengers. But there is an option which swaps out the middle row seating with 2 oversized Captains Chairs. The Sequoia also comes with power everything as a standard feature. he is the best at reviewing trucks hes write on in his opinion. 7 years later and its still in production with the same 5.7 liter. That engine is bullet proof and will last a million miles. My local Toyota salesman says this will continue into production for the foreseeable future. No refresh until 2020 at the earliest. 2018 was last refresh with LED headlights. 18 & 19 are identical. I own the limited. Fantastic road vehicle. Will tow my house off its foundation. 5.7 engine. Only complaint is it is tough to see the instruments. They are in little tunnels and difficult in sunlight to see. I bought mine used for $20,000 with 91,000 miles on it in new condition. Not a scratch or ding on it. Interior like new. It is big, but not as long as my old Suburban. 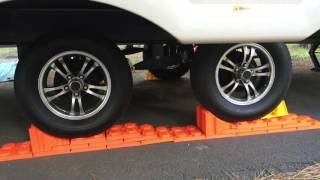 The 4-wheel drive system is simple and works beautifully. Going to buy a 9,000 lb. trailer for cross-country. This car will handle it with ease. Watching this in 2018. Sequoia still in production. 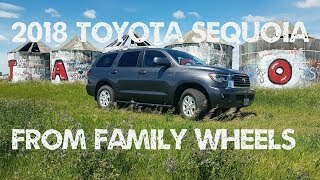 Sequoia is a true SUV!!! 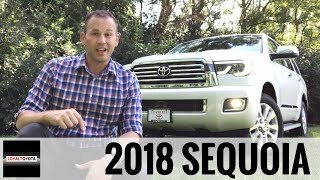 Sequoia is the best SUV money can buy, because it's the most reliable and people will never have an issue with turbos because there's none, and people will never have carbon build up because it doesn't have direct injection like competitors. It's not rice burner with turbo. It's not a Prius with Auto start/stop. It's not a iPhone on wheels that needs to reset by the dealer every 6 months and replaced every couple years because of the issues. 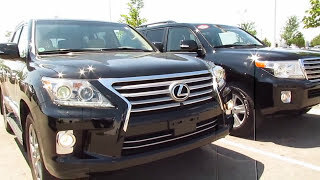 It's reliable SUV that can go 500k miles without touching engine or transmission. Also, it's simple, reliable, comfortable and holds it's value better than any other SUV. Great on gas for its size. I have one and love it. If you want an SUV that has a cargo space about the size of a pickup, this one has it. Over 100 cu ft. Your video is trash .. it’s not about you , it’s about the car .. I hope your other videos have more content to byte on ..
Do some research before putting a video. There is no pride about the 5.7 L engine, which was available since the start 2008 and the difference between the 4.6 and 5.7 is only $ 700. How is using the key harder ? utilitarianism is the greatest good for the greatest number, it is not synonymous with utility. that is one booooring looking vehicle. i would be afraid to drive any distance for fear of falling asleep. tillallareoneluv This isn't boring! It is so nice!!! The Sequioa REALLY needs to get updated if it wants to keep up with the best SUV on the market, Chevrolet Suburban. Mr. Pink true. The new Suburbans look great. I like the Sequioa but it needs an extra-long version to compete with Suburban. 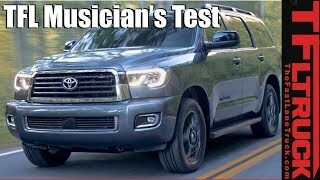 This is for ALL the people that believe "for a fact" that their Toyota Sequoia SR5s always came with a 5.7. I got this from the wikipedia page, only proving what this man in the video has said. "The 4.7 L is standard on the SR5, while the Limited and Platinum models come standard with a 5.7 L V8 engine. Four-wheel drive is available on all models." I own a 2008 Sequoia SR5 with a 5.7L V8. The SR5 has 4.7 as the base engine but you can get the 5.7L in a SR5 as an upgraded option. So yes, he was wrong for implying that you could only get the SR5 with a 4.7. 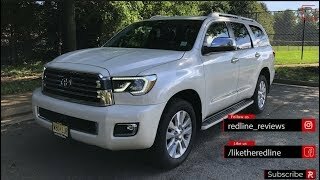 From edmunds.com: "Optional on the SR5 and standard on all other Sequoias is a 5.7-liter V8 good for 381 hp and 401 lb-ft of torque. " Wow its disgusting how rude some people are, like some of the people down below that left comments. They really need to grow up. Anyways, great video! 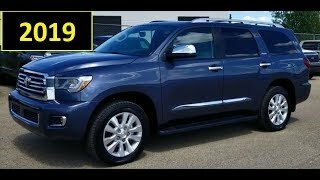 I am looking at a 2016 Toyota Sequoia Limited and plan to purchase it one day. Absolutely love it! 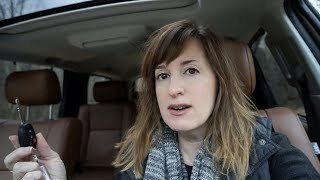 I own a Chevy Suburban, and I feel that the Toyota has a larger feel on the inside and has a much more powerful engine. I found this video to be very useful. Thanks! AyeYoFranke Toyota doesn't last longer? ? Really? ????? +KingFlash7 ok go ahead and buy your chevy/ford. i'll get a Toyota. Let's meet after 3.5 years to check who's car is still in one peace. Chevy+Ford are POS and everyone knows that. 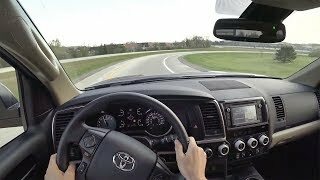 I have 2008 SR5 4WD with 5.7L engine. The 5.7L engine has been available on SR5 since 2008.
what year is it though? Around 2013-2014 they took put the 5.7 across the trims. Before that, there was a different engine for the SR5. is it real? 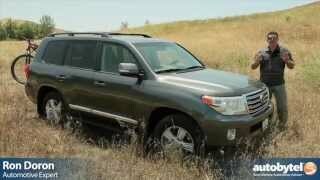 the sequoia is going to be replaced by land cruiser? 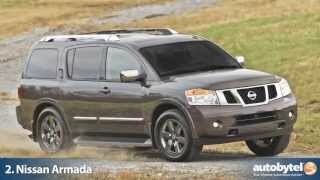 Well this video came out in 2012, it's now 2017 and the Sequoia is still available. No need to worry. Nope. 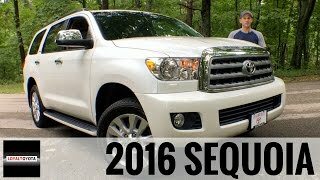 The Sequoia is still available this year (2016) and is going to be redesigned in 2017 along with the Land Cruiser. 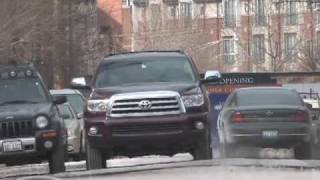 +yikai zhu Well this video came out in 2012, it's now 2015 and the Sequoia is still on Toyota's website. No need to worry now. This review is full of errors. The SR5 is the value deal here. Has most all of the nice features, same driveline, same quality...and a liveable price. I own one; tow a 6000# trailer- its great. Gets mileage in the high teens -even over 20- on the highway. Towing- about 10 MPG. I am extremely happy with it. And SR5 is available with the 5.7 engine with 4WD, I own one. It depends on what year your SR5 is. Up until about 2013-2014 they had a different engine for the base model SR5 until they put the 5.7 across the trims. Also, there are some features that don't even come as options for the base SR5, which some people might actually love. It depends on your view of what is necessary or not to determine what you think a good value is. To you, the good value might be the base model SR5. To someone else, the Limited might be the best. Also, gas mileage is determined by how YOU drive. The testers might have driven a bit harder which caused the gas mileage to go down on average, so your numbers might be only correct for you. His review is incorrect. You can buy the SR5 with a 5.7L. 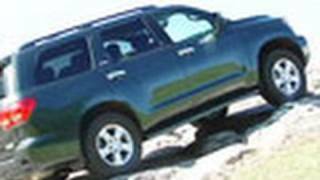 2007 Toyota Sequoia - Black!